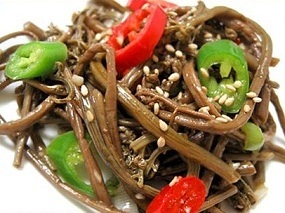 Gosari namul is a Korean side dish that is made with bracken fern stems, sautéed with classic ingredients such as soy sauce, garlic, green onions, sesame oil and sesame seeds. Raw form of ferns is sold in Korean markets either dehydrated or hydrated in water where pre-soaking is absolutely necessary to make this side dish. It's a non-spicy dish which has a soft, chewy texture commonly found in mixed rice dish bibimbop. It is also usually prepared during Korean holiday such as Lunar Year or Korean thanksgiving, possessing great health benefits, packed with calcium and known to detoxify the inner organs of your body.